SILICON SLOPES, Utah – October 6, 2015– This week, Domo is at the Gartner Symposium ITxpo 2015, one of the world’s most prestigious gatherings of IT leaders. Domo is demonstrating how it enables IT leaders to more effectively manage operations through Domo’s cloud-based business management platform. Domo also is demonstrating how it helps IT leaders meet the growing demand for real-time data access and reporting from business users across the enterprise, while minimizing the impact on already-strained IT departments. Domo, by easily and reliably connecting to hundreds of cloud-based and on-premise data sources, gives IT leaders one platform from which they can manage their own business, while also meeting the diverse needs of users across the enterprise. Through designed administrative controls and enterprise-strength security, Domo provides confidence that all data access and usage complies with corporate policy. Domo’s maniacal focus on the user experience makes it easy for non-technical people to access and interact with their business data, without calling on IT for the time-consuming, repetitive tasks of report creation and dissemination. Domo – through tools such as self-service connectors, Magic ETL and QuickStarts – further reduces the burden on IT, allowing IT to spend more time on strategic business initiatives, rather than repetitive, time-consuming tasks associated with getting data into the hands of business users. 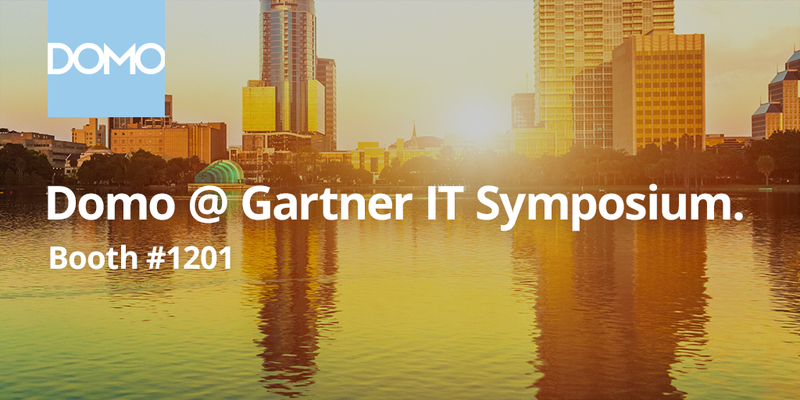 Attendees can see Domo in action at the Gartner Symposium in booth 1201. More information can also be accessed via the Domo website. Domo is a cloud-based business management platform that gives CEOs, managers and decision makers across the business the ability to make faster, more effective decisions by giving them one place to easily access all the information they need. With more than $450 million in funding, Domo is backed by an all-star list of angels and investors including Benchmark, BlackRock, Capital Group, Fidelity Investments, Founders Fund, GGV Capital, Glynn Capital, Greylock Partners, IVP, salesforce.com, TPG Growth, T. Rowe Price, WPP and Zetta Venture Partners, plus CEOs of the world’s largest SaaS and Internet businesses. Domo’s founding team consists of some of the most sought after talent in the industry with experience that includes Amazon, American Express, Ancestry.com, eBay, Endeca, Facebook, Google, LinkedIn, MLB.com, Omniture, salesforce.com, SuccessFactors and SAP.